Spinning silk . . . or, What was I thinking? I saw the image on the cover of Crochet So Fine, a book of crochet patterns. I fell in love with it: a “wrap cardigan” of such exquisite lace, with a large pineapple motif centred on the back, three-quarter sleeves fashioned with intricate vertical designs, and a deep V-neck achieved by crossing one front over the other and tying wispy ties at the back. I am not a maker of intricate crochet. I once (way, way back when) crocheted bulky toilet roll covers for everyone in the family for Christmas. I’ve crocheted mushroom tree ornaments. I tried to crochet cute little lacy strips meant to adorn the fronts of my kitchen shelves (in some sort of decorating madness) and ended up ripping everything apart and depositing the leftover crochet cotton in the thrift shop. But when I first set eyes on that stunning crocheted wrap (“cardigan” just doesn’t do it justice), I knew I had to make it. And I had to make it with mushroom-dyed silk. Silk comes in many forms, and I decided to dye and spin silk “hankies,” soft, fly-away bundles, each made up of eight to ten layers of gossamer. Each layer must be peeled gently from the stack, then carefully stretched, stretched, and stretched some more, until the long, weightless strand is just a few fibres thick. Then it’s time to spin. As with most handspinning, preparing the fibre takes up the greater part of the time; once the wheel gets going, the silk fairly slides across my fingers, building up in fine layers on the bobbin. I divide each hankie into two bobbins, so that two fine strands of the same colour can be plied together into a balanced silk thread. I then wind the silk thread into little skeins. I love to fondle these wee treasures in the sunlight, admiring the characteristic sheen imparted by true silk. Each skein measures close to 50 yards. I will need a little more than 2,000 yards to complete this garment. I don’t want to think of the time required to complete this garment. I am in denial that I will one day have to sit down with a crochet hook and create this garment.. Right now I’ll just enjoy spinning and fondling my silk in the sure and certain knowledge that one day, if nothing else, I’ll be laid out in a Phaeolus-dyed, handspun silk shroud. Now that’s ambition! It will be a labor of love (and time)! Thanks. You may want to check back in ten years – I may have started on it by then. I tried once to learn to knit and failed miserably. Same with crochet. But oh how I covet those amazing sweaters and hats that fall outside my abilities. Thanks for the vote of confidence! It’s the weavers and quilters whose work I covet. beautiful skeins which I’m sure will be a joy to crochet or knit with and in the meantime – fondle! Thank you – yes, some skeins were made just to fondle. That is a very ambitious project you have undertaken. I have been spinning on a wool/silk blend……….more to see how the dyes appear on the handspun blend than an idea of making something. As I have been spinning, I have been thinking about passing it all but the finished skein to someone else……….and much of the fiber has already left the house. 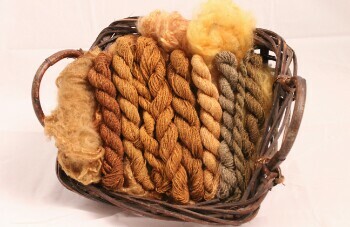 I love to dye silk, but I don’t like spinning it, working with it, and not overly fond of wearing it. But I just had to give it a try. How many colors will you be dyeing, or will it be just one? I read in your blog that you use Alum for your mordant. Do you ever use any of the other mordants? I use them all and have for over 40 years now……..I love the variation you get from the different mordants and then the different modifiers that you can use. Ambitious, or just plain nuts, I’m not sure which. 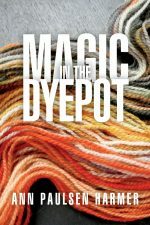 For this project, I’m using only Dyer’s Polypore, the most abundant of the dyers around here. I use copper and iron as mordants. I know you use tin and chrome, too (I was at Mendocino in 2008 when you talked about them) , but I’m reluctant to add those to the mix. Thanks for all your comments. I know what you mean about the community getting used to the strange person who spends so much time in the forest looking for dye mushrooms! I thought I remembered you from Mendicino, but that was such a whirlwind………and then Dorothy asked me if I would put my hand in with the teaching of the mushroom dyeing, so my thoughts had to be collected and tried to get passed on with some semblance of intelligence. Dorothy and I have been arguing over mordents for years and years. I love and use them all, she mainly uses alum with occasional iron. Miriam started out using them all, but her kids talked her into just using the alum and iron. The scientists stand behind my use, so I just add that to the lectures and everyone can decide for themselves. Bet the Dyer’s Polypore on that silk will be terrific.